LAN for juniors and seniors!! 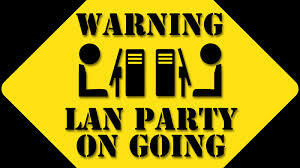 The LAN is a very popular event! Available tickets are directly depending on available parents. As of now, we only have 4 parents and therefore we can only sell 40 tickets. If we have a few more parents who can volunteer to be at school for a few hours each, either starting late in the evening of April 5th or a couple of hours during the night or helping out in the morning before 9am on April 6th, we can allow more tickets to be sold. And I assure you, more students want tickets.